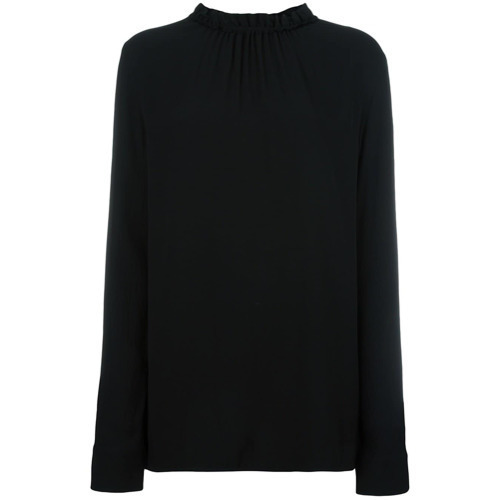 If you're searching for a casual yet absolutely chic outfit, consider teaming a Marni ruffle collar blouse from farfetch.com with white skinny jeans. Both garments are totally comfy and will look fabulous together. Break up your getup with more casual footwear, such as this pair of black and white low top sneakers. If you're looking for a casual yet chic ensemble, try pairing a Marni ruffle collar blouse with olive skinny jeans. Both garments are totally comfy and will look fabulous paired together. When it comes to shoes, this ensemble is complemented well with red and black suede pumps. 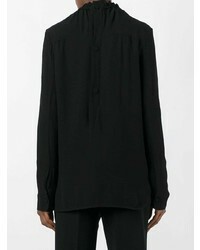 If you're on a mission for a casual yet stylish ensemble, rock a Marni ruffle collar blouse with black skinny jeans. Both garments are totally comfy and will look fabulous together. Complement this look with white leather oxford shoes. For a smart casual look, try teaming a Marni ruffle collar blouse with black leather skinny pants — these pieces work nicely together. Break up your look with more casual footwear, like this pair of black ballerina shoes. If you're in search of a casual yet chic ensemble, try teaming a Marni ruffle collar blouse with a black floral mini skirt. Both pieces are totally comfy and will look fabulous together. Make black print leather loafers your footwear choice to kick things up to the next level. If you're in search of a casual yet chic getup, try pairing a Marni ruffle collar blouse from farfetch.com with a tan suede mini skirt. Both garments are totally comfy and will look fabulous paired together. If you're on a mission for a casual yet chic getup, marry a Marni ruffle collar blouse from farfetch.com with white and black print leggings. Both garments are totally comfy and will look fabulous paired together. And if you want to instantly amp up the style of your look with one piece, add black leather ankle boots to the mix. 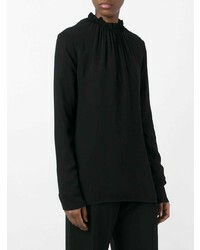 If you're looking for a casual yet stylish outfit, wear a Marni ruffle collar blouse and black leather leggings. Both items are totally comfy and will look fabulous together. Rocking a pair of black leather ankle boots is a simple way to add extra flair to your ensemble. For an outfit that provides comfort and chicness, consider pairing a black long sleeve blouse with a gold pleated midi skirt. When it comes to footwear, this outfit is complemented wonderfully with black elastic ankle boots.